Markets dropped yesterday despite a generally bullish EIA report, with crude oil shedding 85 cents (1.5%). Yesterday continued the three-day loss streak, with prices falling from $58.02 on Tuesday down to a closing price of $56.40 yesterday, a 2.9% loss. Today, prices are continuing their decline, giving up 29 cents (-0.5%) this morning to trade at $56.31. Fuel products saw even steeper losses yesterday, with diesel prices giving up more than 4 cents (2.1%) and gasoline shedding a huge 5.7 cents (3.3%). Those losses were more in line with Brent crude losses, which were roughly 2.3%. Refined products in the U.S. tend to follow Brent prices more closely than WTI crude oil; since U.S. refined products are still easier to export than crude, they are more closely linked to international oil prices. Today, diesel is currently trading down 1.2 cents (-0.6%) at $1.8929, the first time diesel has been below $1.90 in a week. Gasoline prices are at their lowest since mid-October, though prices are up 1.2 cents (0.75%) and trading at $1.6590. The EIA released their weekly inventory data yesterday, which showed a smaller crude draw than the API’s report, though still larger than expectations. Gasoline builds exceeded expectations, while diesel draws were in line with market predictions. After a strongly bullish API inventory report, the EIA’s data was a bit of a let-down, though the net draw across oil products should have given support to prices. Of note, the EIA announced that domestic production rose yet again, setting a new weekly record that puts in line with production levels in December 1970. Markets were sent plummeting by the International Energy Agency’s monthly market update showing that the first half of 2018 may see an overall surplus of 0.2 million barrels per day. Still, the report showed that OPEC’s supply cuts have made a major dent on supply, with OECD inventories falling 40 millions barrels to be just 111 million barrels above five-year averages. Adding to the price decline, particularly the 2.3% loss for Brent crude, was aggressive producer hedging as the contract hit YTD highs of $64-$65 over the past two days. 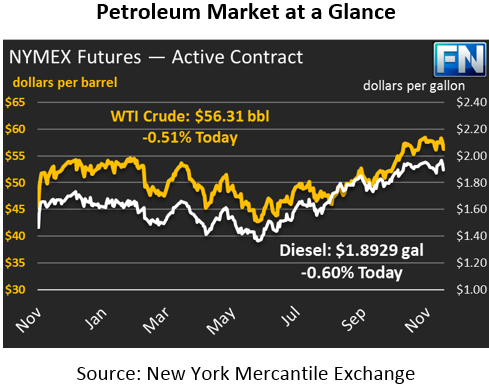 To lock in prices, producers sell contracts on futures markets, guaranteeing their price on future barrels. The strong selling activity pushed Brent prices lower, and helped counteract any upward momentum that may have come from the EIA’s data. Of course, financial markets of all types were affected yesterday by the Fed’s announcement of a 25 basis point increase. Typically interest rate hikes boost the dollar, but yesterday the dollar fell in response to Yellen’s concern over ingrained low inflation rates. Markets have been expecting an interest rate hike in the last month of the year, so the announcement came without the normal enthusiasm for a strong dollar. It is surprising that the falling dollar didn’t give more support to falling oil prices; the dollar and oil tend to be inversely correlated. Over the past year, though, it’s become common for fundamentals to overwhelm the dollar’s impact on crude oil, so the IEA’s threat of an oversupplied market became the main attraction yesterday.